HIT PICK TO CLICK: BLACKEST NIGHT 'REBORN' TITLES: Tying in with the Blackest Night theme, 8 classic DC titles 'rise from the dead' for one more issue. They are; The Atom & Hawkman #46, Catwoman #83, The Phantom Stranger #42, The Power of Shazam! #48, The Question #37, Starman #81, Weird Western Tales #71, and Suicide Squad #67 (Which itself crosses over with Secret Six #17)! For more details stay tuned over the next few days for the 'DC 1-0-One Shot' Resurrection specials - where we look at whose in and on each issue, and more importantly why you should care. MARVEL: It's official 'Cap Fever' is the first virus of 20-10. 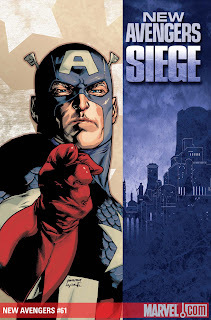 Catch the Cap outbreak in the final issue of Captain America Reborn (6), the restart of his ongoing series (Cap #602 - now with Nomad back-up strip), the 'event' book SEIGE (1) and the tv-hit based Super Hero Squad #1, among others. IMAGE: Britain's greatest hero strikes again in his off-beat new series The Weird World of Jack Staff #1 by Paul Grist. DC COMICS: The 'new' JLA launches in Justice League of America #41. Meanwhile over in the imprints, Grant Morrison's new creator owned mini-series Joe The Barbarian debuts from Vertigo, and at Wildstorm, Kurt Busiek, Brent Anderson and Alex Ross are back with a slice of the life of a mid-80's superhero, in Astro City: The Dark Age Book 4 #1. COVER OF THE MONTH: NEW AVENGERS #61 Okay so having Cap pull an 'Uncle Sam' isn't exactly original, but hey not only does artist Stuart Immonen fling the shield out of the park with this wee number, this ish marks the return of Steve Rogers as Captain America to the Avengers. This means it should contain a healthy amount of a Cap whose had it up to here with all the 'Dark Reign' carry on, rounding up Clint, Hank, Monica and the gang, and setting out to get things sorted. Hence the finger pointing. When a cover looks as good as the JLA one - there's little option but to go out and buy it! Can'e wait! Thanks for the post Jonathon! Yip seems big things are instore for the League!